Within this audiobook lies the secret to the best-tasting chocolate in all the world. I promise, your taste buds will tingle. Your palette will sing! Oh no, have I accidentally tempted you to listen to this audiobook? 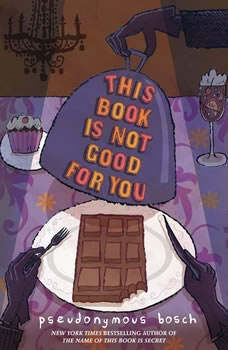 I will warn you, however, the most delicious things are never good for you...and this story is particularly scrumptious!In this tooth-rotting adventure, Cass's mom has been kidnapped by the evil dessert chef and chocolatier, SeA±or Hugo! The ransom...the legendary tuning fork. Can Cass and Max-Ernest find the magical instrument before it's too late? Will they discover the evil secret ingredient to SeA±or Hugo's chocolate success?If you're tempted, take a taste, but just remember...this book is not good for you.